Have you ever worried about the safety of your baby while they sleep? Of course you have - it’s a worry that plagues every parent. Even before your baby is born, there are family members and medical professionals giving you conflicting advice and scary warnings about when, where and how your baby should sleep. It’s become a controversial subject. One thing every new parent in Western countries is told is NOT to co-sleep with their baby. This advice is often perplexing to new parents, who rightly think that keeping babies close as they sleep is best for bonding, soothing and midnight feeding. When people warn against co-sleeping, they actually mean bed-sharing. This is the practicethat is actually dangerous to babies; while safely co-sleeping using a co-sleeper cot is highly beneficial. Haven’t heard of co-sleeper cots? Neither had I, until finding out that these miracle beds for babies exist a year ago when searching the internet for a cot for my firstborn. I faced the same frustration as many expectant parents over not wanting to put my baby in a crib far away from me to sleep, and thought that there had to be an alternative. Enter the baby cosleeper bed – the solution all parents should know about. Why? Read on to find out why these baby beds are the safest, best infant sleep method that hold a host of benefits for you and your baby. What Makes Them Different from Other Cribs and Beds? So Just What Is A Co-Sleeper Cot? What Is A Co-Sleeper Cot? The Chicco Next2me side-sleeping cot has an additional fourth wall that can be removed to turn the sleeping basket into a co-sleeper crib. Chicco states that the bed is perfect for new-borns, and can be used up until around 6 months or until your baby can pull themselves to a standing position. This model comfortably sleeps one child. Its adjustable legs make it easy to join the cot to the side of any height adult bed. We’ve rated this product 5 stars as it’s versatile, portable, and affordable. While some parents have noted that the mattress is firm, it’s recommended by childcare experts that babies should sleep on a firm mattress. 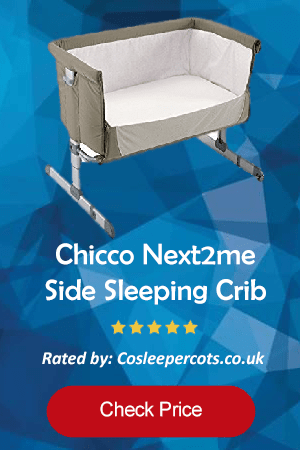 Chicco is a trustworthy brand with a range of cosleeping crib products – you’re sure to find one that suits you, but our favourite has to be the Next2me. This stylish crib comes in a variety of colourways to suit any bedroom or nursery. The SnuzPod² frame is constructed from sturdy wood with breathable mesh inserts for a safe and comfortable night’s sleep for your baby. It works as a normal crib, a three-walled cosleeper bed, or as a standalone bassinet/Moses basket when legs are removed. It has adjustable height settings and fits alongside any adult bed. 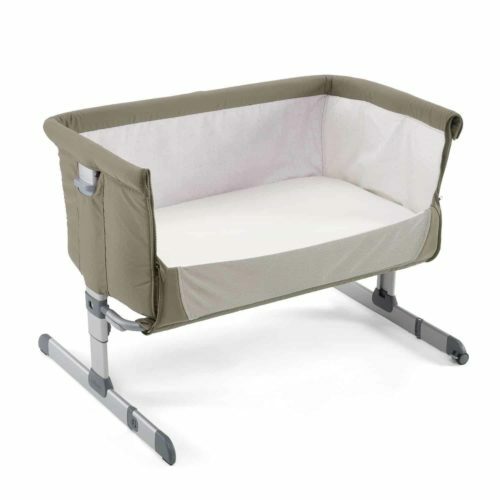 We awarded this cot with 4.9 stars – losing just a small fraction due to not being portable. Its sturdy frame makes it heavy and therefore hard to travel with in or out of the house, though it makes for a dependable and secure permanent bed for your 0-6-month-old baby. We recommend SnuzPod for their beautiful products and safe-sleeping ethos. This slightly upgraded version of the SnuzPod² has new features that help reduce babies’ reflux symptoms and isn’t quite as heavy. The SnuzPod 3 has an ‘incline’ option, which tilts the bed to an angle that soothes your baby’s reflux discomfort. This model was constructed to weigh less too; so, parents can easily move it around the house during the day to keep their baby napping close to them. It’s a perfect choice for parents looking to securely co-sleep close to their baby, as it fits directly onto any size parental bed. The SnuzPod 3 is suitable from 0-6 months, and like the earlier edition, can be used with four or three walls, as well as a Moses basket or bassinet without legs. 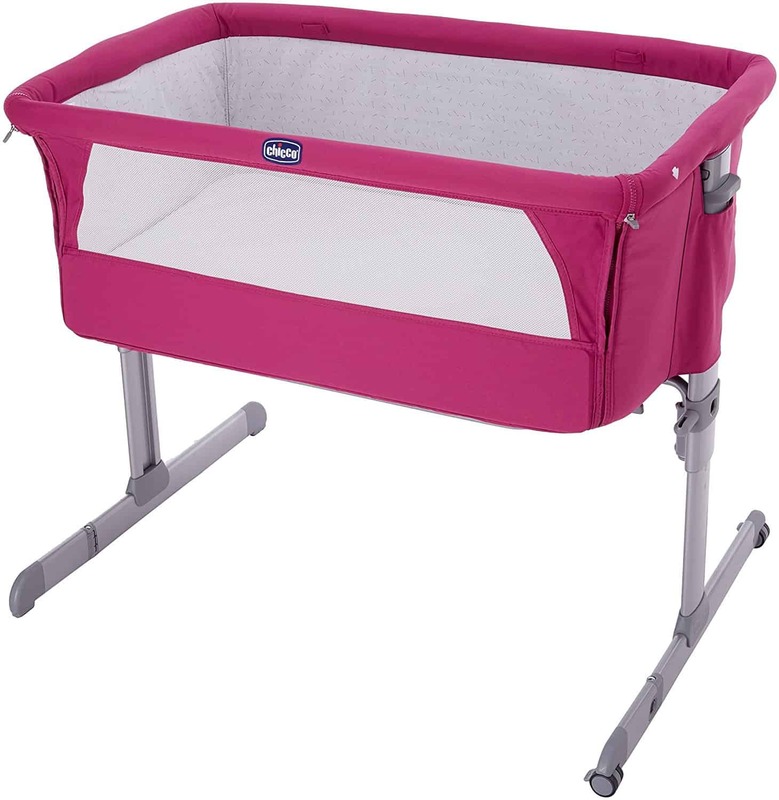 It has adjustable height options, mesh barriers around the cot, and comes in a range of colours. We love the SnuzPod 3, though it loses a tiny point for not addressing the letting-in-light issues of its last model and still can’t be easily travelled with. 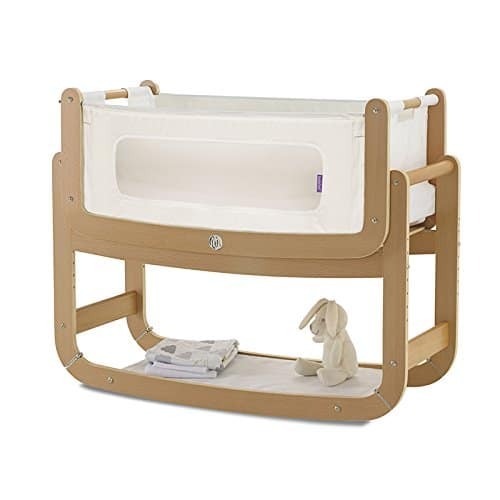 The WALDIN Baby Bedside co-sleeper cot is the cheapest of our selection. It’s designed with a slatted wooden frame, with a textile bumper to keep your baby safe from getting stuck between the slats. It’s a traditional-looking crib, coming in white painted or untreated natural wood options, with several different colour and pattern choices for the bumper material. We love this crib because of its charming traditional design, and the fact that it can be turned into a children’s ‘sofa-bed’ once your baby is big enough to no longer need a crib. The WALDIN Baby Bedside’s drawbacks include that it has wheels; which some parents may consider unsafe, albeit there are brakes. A second downside is the slats, which some parents prefer not to have due to babies becoming stuck between bars in the past. The bumper should prevent this, although some gaps are still accessible. While the crib has to adhere to safety measurements surrounding gap sizes, it’s down to personal preference of the parents. The Armsreach Universal is perfect for parents looking to co-sleep with newborn twins – its extra-large sleeping surface area comfortably sleeps two babies so that both can be near their parents at night time. It can be used up to when babies turn six months old, or when they can pull themselves upright into a standing position. The bed is cream coloured and comfortable. Armsreach says that this cot can be used as a cosleeper bed, travel cot, play pen and baby-changing table – though its large size would make it hard to travel with. We give the Armsreach Universal a 3-star rating due to the fact that it’s non-portable and has a very chunky design. It claims to be travel-efficient, but we found it’s far too heavy and cumbersome. It doesn’t have alternative colour options, and is a pricier model compared to the other beds on our list. Reviewers found it hard to assemble and weren’t keen on the beige material. In a nutshell, baby cosleeper cots are three-walled bassinets that attach like a side sleeping crib to the parental bed. Think of it as a sidecar attachment. They come with their own baby-safe mattresses and every other feature of a normal crib, except that they allow you to keep your infant within arm’s reach, with no barriers between you. You might hear them referred to as co-sleeper cots, baby cosleeper beds, side sleeping cribs, or co sleeper bassinets throughout this post - but rest assured that so long as the cot has three walls and is attached to the parents’ bed, it is a co-sleeper cot! Co-sleeper cribs were created in order to bridge the gap between having your baby in bed with you and putting them to sleep in a separate crib away from your bed. Neither of these options are ideal for parents for a number of reasons that we’ll discuss later. Co-sleeper cots provide the perfect middle-ground, allowing parents to reap the benefits of cosleeping with their baby while keeping them safe during slumber. Check out our top picks for baby cosleeper beds below. What makes co sleeper beds the safest option for baby sleeping? Below, we discuss the pros and cons of other baby sleeping options and why co-sleeping cots solve these issues. Adults and babies have their own mattress. Baby mattresses are firm, thin, and should have no pillows, blankets or toys covering them. This is to prevent suffocation. In a co-sleeper cot, babies are prevented from becoming entangled in sheets and duvets on adult beds. They are not linked to SIDS. Cosleeper cots provide a safe method of co-sleeping as they keep parents and babies on separate sleeping surfaces. SIDS (Sudden Infant Death Syndrome, otherwise known as cot death) is a condition that terrifies all parents, as it causes the death of infants under one-year-old for unknown reasons. What we do know is that SIDS is linked to parents sleeping in the same bed as babies, especially on an adult mattress or sofa. No risk of overlying. Overlying is the sad occurrence of a parent rolling onto a baby in the night, causing accidental death. This is a risk of bed-sharing which is eliminated by using a co-sleeper bed. Better rest for parents and babies. With a co sleeper cot, babies are in arm’s reach of their parents. If mum wakes up and wants to check if baby is okay, she can simply reach out, and can hear them breathing. Many parents bed-share for the reason that they like having baby as close as possible - but this comes with the risk of SIDS. Reduces parental exhaustion. An exhausted parent = a clumsy parent. While being a new mum or dad automatically means you get less sleep, having a cosleeper cot means you don’t have to leave your bed at all during the night, and can therefore get a lot more shut-eye than if you had a separate crib. Reduces risk of falling asleep with the baby in your bed. With a regular crib, most mums retrieve their baby from his crib, and take him into the parental bed to feed. Sometimes when the baby is done feeding, Mum is simply too exhausted to take the baby back to his crib, thinking ‘it won’t hurt if he sleeps in bed with me just this once’ - that is when accidents happen. Using a co-sleeper crib means that your baby’s bed is directly next to you, so you can gently place the baby back in his safe sleeping space as soon as he’s settled again, and you can both go back to sleep in your own beds. For more information on co-sleeper cot safety, see our Ultimate Co-Sleeping Guide for everything you need to know about the practice, from the history of cosleeping to information on preventing SIDS. Three walls: co sleeper beds have three walls made from baby-safe material. The one that is missing is where the crib attaches to the side of the parental bed, as if the baby is sleeping exactly by your side. Attachable fourth wall: most co sleeper cots can be turned into a traditional crib/bassinet with a fourth wall attachment. This is useful for using it elsewhere in the house, such as if you want baby to have their daytime nap in the lounge with you; or for when you want to transition your baby to sleeping independently as they grow. Adjustable height: as adult beds are different heights, co-sleeper cribs come with adjustable legs so that you can bring the height exactly so both mattresses align. Travel bag: most cosleeper cribs are easily disassembled and come with a travel bag, so that they can easily be taken with you on overnight trips. 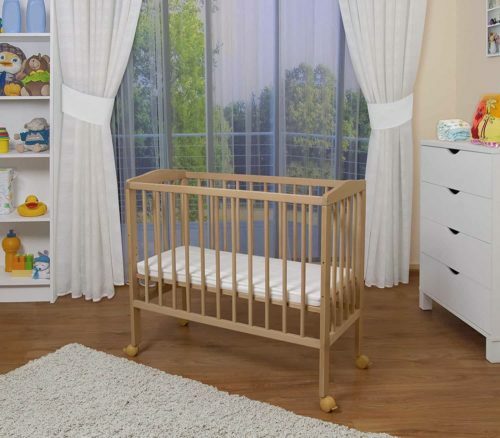 Cribs: traditional cribs are wooden-framed, with non-adjustable legs, and are entirely separate from the parents’ bed. This means that when the baby cries in the night, the parent has to exit their bed and walk to the crib, ultimately disturbing the sleep of both parties. The parent may then take the child into their own bed to cuddle and feed them, with the risk that they fall asleep with the child in the adult bed. The benefits of co-sleeper beds for babies speak for themselves! If you, like myself, feel uneasy at the thought of putting your child to sleep in a crib far away from your bed, you’re not alone. Not only would that make me less alert to her cries in the night, I was worried that getting out of bed countless of times each night to feed and console her would leave me incredibly exhausted. Our cosleeper bed solves all of these issues. At the moment, as I’m breastfeeding, we keep our baby’s cot attached to my side of the bed, so I can quickly feed her when she wakes up hungry during the night. I love that I can feed her in the side-lying position, barely having to move, then can simply put her back in her bed directly next to me when she’s finished! As she grows and weans from breastfeeding, we can move the crib over to my husband’s side of the bed so he can take his turn to tend to her at nighttime. I really feel that the cosleeper bed increases my bond with my baby. It’s scientifically proven that parents and babies who sleep side-by-side sync their breathing, dreaming and sleep cycles together - this can help babies learn to sleep through the night quicker, and do as their parents do. Sleeping nearby also means baby is less likely to form an attachment to a ‘comfort item’ (blanket, toy, etc), and she’ll be more likely to feel emotionally secure as she grows. Like anything, there are slight drawbacks. For example, my husband is an extremely light sleeper, and having her so near means that he often lies awake listening to her every snuffle and yawn. However, we think that she cries a lot less being near us. If she were further away, she’d be much noisier calling for our attention all the time, so we believe it balances out. We knew we had to sacrifice our sleep the moment we found out we were pregnant, anyway! Basically, our co sleeper bassinet allows me, my husband, and my baby to enjoy all the benefits of bed-sharing, but without the associated risks of overlying and SIDS. It really is exactly the solution I was searching for. Want to know more about co-sleeper beds in practice? Read below about another mum’s experience with her co-sleeper cot. In this section, we hear from another new mum who tells us about her worries, advice and solutions surrounding her baby’s sleeping arrangement; and how she found using a co-sleeper cot for her newborn. I myself became a first-time mum just this year. If you are anything like me and most parents-to-be out there, among all of the things buzzing in your heads and worrying you as you prepared for your babe’s arrival, sleep safety is/was probably one of the biggest priorities, mainly because of SIDS concerns.SIDS (AKA Sudden Infant Death Syndrome) is seriously one of the scariest things for soon-to-be-parents to face and prepare for.Every sleep related item, from cribs and bedside bassinets to blankets and stuffed animals ALL have the warnings on them!Every website, every conversation with a nurse or pediatrician – seriously everyone reminds you of the dangers of SIDS and the ABC’s of proper sleep safety (Alone on their Back in a Crib).We even got a baby sleep sack that ended up having a cute little woodland creature on it that says “Back is best” to remind you to not put your baby to sleep on his tummy!All that is to say – sleep safety becomes a bit of an ever consuming obsession.But you probably, like my husband and I, also want what’s best for your baby as far as the ability to comfort and provide for him throughout the night, and make sure he has the best situation for healthy development.And you probably have had friends (or strangers), maybe even a medical professional or two, quietly but urgently justify to you why they let their baby sleep in their bed or on their chest, and assure you that it is perfectly safe, and some of their explanations may sound extremely legitimate and enticing.For us, all of this made finding the right sleep solution for our baby extremely difficult and nerve wracking. We considered a normal side sleeping crib at first, thinking it was the best option available for our needs.Just before we were about to order a four-wall crib, we finally found a solution that truly resolves every concern about sleep safety in the co-sleeper crib, and we want to share it with other concerned soon-to-be and already-parents out there! In the end, we bought a three-wall co sleeper bedside bassinet, with the ability to add a fourth wall, if it turned out we didn’t like the arrangement. However, our baby is now six months old, and we always use his cosleeper bed with three walls at bedtime. We found that, by using a co-sleeper, you can:- Follow the ABCs while still having your baby right next to you almost as if he was sharing your bed.- Easily breastfeed in a side-lying position (which most midwives agree is the best nursing position anyway). All without worrying about:- Rolling over onto the baby.- Baby getting caught up and suffocating in the blankets.- Baby falling off the bed.- Not hearing and being able to best care for baby because he is in another room.- Accidentally falling asleep while sitting up with baby to feed him. The co-sleeper crib solves all safety problems while still enabling the closeness, bonding, and nursing opportunities so important to the early stages. It enables the benefits of bed sharing without any of the risks. I will definitely be using mine again for our second child, and can’t stop raving about them to my mum-to-be friends. I totally recommend all new parents to consider one for their new babies! In the past, and still sometimes now, parents put their babies to sleep in a separate nursery from the moment they were born. Usually this was a habit of richer parents, who had enough rooms in their homes for the baby to have her own; and could also have been due to the presence of a nanny who was hired to tend to the baby at night, preventing the disturbance of the parents’ sleep. Fast forward to present day, and we now know that this isn’t healthy. Babies who sleep in their own room from infancy have been found to form attachments to ‘comfort objects’ that they cuddle at night in substitute of their parent. Room separation also tends to go hand-in-hand with the ‘controlled crying’ ideology, which does neither party any good. Controlled crying is the practice of leaving your baby to ‘cry it out’, with the hope of training them to self-soothe and gradually stop crying out at night. Tip: this does not work. Babies cry for a reason - because they’re hungry, cold, hot, wet, sick, or simply lonely. Contrary to the controlled crying belief, it is, in actual fact, tending to your baby’s need that will stop them from crying. Babies can’t learn to change their own nappy, nor do they know that you are coming back to see them in half an hours’ time. Having your baby share your bedroom means you can tend to their needs quickly and easily, settling your baby in a way they can’t do on their own. For most of human history, we didn’t have the luxury of living in secure houses with multiple bedrooms for our children to sleep in. It is entirely natural to keep your baby close to you at night (going back as far as holding them close to keep them safe from predators) as this allows for easy comforting, feeding and midnight check-ups. Further than just sharing a room, cosleeper beds for babies mean that you can keep your child as close as in the same bed but WITHOUT bed-sharing, maintaining all the safety standards recommended by paediatric experts. Before you rush out to buy a baby cosleeper or side sleeping crib of your own, or place an order for one online, you should carefully check the features and specifications of the product. Check if the co sleeper cot allows you to adjust the height or not. If so, click buy now! If not, be sure to measure the height of your bed (including mattress) to make sure they will align. Find out if the product can be turned into a four-walled bassinet. Depending on your preference, you may want to look for a new one. Having a fourth-wall attachment is very useful for using the cot as a day bed for your baby and travelling with it. We’ve reviewed only the best cosleeper cribs on this site that meet all safety and quality standards. If you decide to look elsewhere for a co sleeper cot, make sure the model and brand are fully safety-tested. Don’t be roped into buying a cheap bed for your precious baby that could be faulty or unsafe - be sure you’re spending money on a top quality product. Finally, never use the bed before you’ve read the instructions included and have assembled it according to the manufacturer’s directions. If at all unsure about the structure of the bed - do not use! If you are like the majority of mums-to-be out there, you have likely been doing a lot of research about the best sleeping solutions for your eagerly expected little new born. With all of the worries about SIDS (Sudden Infant Death Syndrome) and suffocation, finding the safest, most secure yet comfortable method for putting your little one to bed is one of the most emotional and mentally consuming concerns for expecting mothers. I know it certainly was for me when my husband and I were expecting our first this past year. Yet, with all my searching, I still missed out on what I am now convinced is the best sleep solution out there: the co-sleeper cot. If you are like most of us new moms, you have been trained to see the phrase “co-sleep” and cringe. Isn’t co-sleeping dangerous? Doesn’t it increase the chance of SIDS? Well, not with a co-sleeper crib. A co-sleeper crib is a brilliant solution that enables you to keep your new born extremely close, while still protecting them from your bedding and the dangers of suffocation or being rolled on. Allow me to lay your fears and curiosities to rest by explaining just exactly what a co sleeping crib is and why I wish my husband and I had discovered it earlier! There are a variety of co-sleeper cribs, but all of them are basically cribs or bassinettes that allow the baby to sleep in his or her own space while still being right by the parents’ or caretaker’s side. While some are small little cots that can be placed on the bed with you, perhaps between you and your partner, the best ones, and the ones which are featured in our reviews, stand next to the bed like a typical bassinette but which have one side that can be lowered and attached to your bed. Essentially, what all co-sleeper beds allow is for baby to sleep very close to mum and dad, within arm’s reach and where they can still smell, hear, and feel your presence, but without the dangers of bed-sharing. Co-sleeper cots are made to fit right against your bed and can have a side lowered and attached to your bedside if you wish. 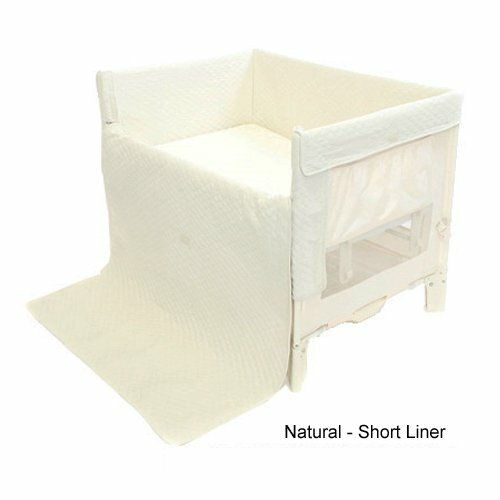 The most versatile of these baby side sleepers will work for babies ages newborn to 6 months or until they can sit up. They are constructed of the traditional baby cot materials and many can be used as a side sleeper or as a regular, stand-alone crib. With the growing awareness about SIDS and accidental death or injury by suffocation or being rolled on, most parents are very aware of the dangers of allowing your baby to sleep in your bed with you. We have all probably heard the “ABC”s of safe sleep: baby should be Alone, on her Back in a Crib. However, most babies (and most new parents) want and even need the comfort and safety of being near enough to smell, hear and touch each other. Even the same experts who recommend the ABCs also encourage parents to keep their baby in their bedroom with them for at least the first 6 months. When you think about all of this, plus the fact that most newborns sleep best by mum’s side after nine months in the womb, plus the fact that newborns need to nurse frequently throughout the night, which results in an extremely tired mummy who may not be able to safely (wakefully) sit up with baby to nurse, and the benefits of a co-sleeper cot are incredibly apparent. A co-sleeper crib solves all safety problems while still enabling the closeness, bonding, and nursing opportunities so important to the early stages. It enables the benefits of bed sharing without any of the risks. A Co-Sleeping Cot, also known as a baby side sleeper, combines the best of the two opposing sleeping options. One of the sides of the crib can be lowered so as to attach to your bedside, making the baby’s sleep space flush with your bed. Safety: because these cots have flat, thin mattresses, three solid, safe walls with the option of a fourth or to be against your bed, they meet all of the safety standards. They keep a baby on her back, on a firm mattress without too much bedding, and allow her to sleep safely in her own sleeping space without danger of being rolled on.These cots avoid all of the dangers that bed-sharing (keeping baby in bed with you) gets a bad rap for. Proximity: while avoiding the dangers of bed-sharing, you still get all of the closeness of it. You will literally just have to turn onto your side and you’ll be able to see, reach out and touch, and hear baby inches from you.And he will benefit from hearing, smelling, and feeling you as well, which is what many newborns need to be able to sleep peacefully and be comforted. If he cries, you won’t even have to get up to see what’s wrong and soothe him. Nursing: if you plan to nurse your baby, you can probably see why this is a fantastic solution. Most lactation consultants actually promote the side-lying nursing position as the best for both mum and baby, as it allows mum to keep resting and provides better milk-flow for baby.However, because of the dangers and fears about bed-sharing, many mums avoid this position, knowing that they will likely fall asleep if they continue lying down while nursing.Well, a co-sleeping cot allows you to easily nurse in the side-lying position without worrying that you could accidentally roll on your baby in your sleep. Sleep: first, when your baby gets to sleep so near to you, and be so easily soothed, she will likely sleep better in the first place, which means you will also get more rest. That is sleep benefit number one.Sleep benefit number two is that, even if you are waking up frequently throughout the night because your baby is hungry, you will not have to worry about falling asleep while nursing her. You can safely nurse on your side and even fall asleep without the typical dangers of nursing her in your bed. We truly do believe that these are the best solution, giving you the best of both worlds of the ABCs of sleep safety and the comforting and developmental benefits of co-sleeping. Co-sleeper cots provide the benefit of sleeping next to baby without the safety hazards: a co-sleeper cot gives the baby his own space, allows him to be safely on his back and still in a crib.However, it gives you extremely easy and immediate access to him, allowing you to reach in to soothe him, make sure he’s warm and safe, and it makes nursing in the night easier as well.All of this is more comforting to the baby and good for his development, as he can smell, feel, and hear you right next to him throughout the night, all of which are very helpful as he adjusts to being out of the womb and on his own. Don’t have to worry about getting up to check on baby: even if your baby hasn’t arrived yet, you know that there is little sleep in your immediate future.This will make getting out of bed to check on your sweet baby, even if her crib is in your room, a rather exhausting feat.As time goes on and the lack of sleep catches up to you, it could even get dangerous, as some extremely exhausted parents end up sleep-walking and being completely unaware of what they are doing as they check on and care for their baby in the night.The baby side-sleeper helps solve this issue, as the parent on the side with the cot can simply roll over to check on their baby and soothe her. No getting up and walking around necessary! Don’t have to worry about falling asleep with your baby in your arms: related to the previous benefit, since you can just reach over to soothe baby, you don’t have to worry about falling asleep while holding your baby in your arms in a recliner or rocker, as one mum I know accidentally did! Don’t have to worry about your bed coverings: if you’ve read up at all, you know one of the biggest warnings against bed-sharing is that your bedding could inadvertently suffocate your baby and/or result in SIDS.With the co-sleeper crib, baby still has his own sleeping space and bedding and will not come into contact with your bedding at all. Don’t have to worry about rolling on baby: again, another reason against bed-sharing is the danger of you or your partner rolling over on baby and injuring or even killing him.Again, because she will have her own, separate sleeping space, there will be no danger of rolling on her, as the remaining walls at the head and foot of her crib will prevent you from rolling into her space. More sleep for all: because the baby will be more comforted by your nearness, and because you will not have to get out of bed to soothe him, the natural result will mean better sleep than if he were in a completely detached crib or in a different room. These are just some of the benefits. You can probably think of your own just by seeing the example! When you are preparing to welcome a new precious little one into your home, there is little else you worry about as much as their safety. Sleep safety is especially that causes great anxiety for many parents. With all the increasing awareness about SIDS and the dangers of bed-sharing, many parents struggle to know what to do for their newborn’s sleep situation. There is so much information and opinion out there, much of which often seems conflicting. But perhaps, in your hours of research you have come across the co-sleeper cot, something we discovered after our little one arrived. Now, if you’re seeing the phrase “co-sleep” in the name and are immediately suspicious (“co-sleeping” is dangerous after all, isn’t it? ), hold on a moment. A co-sleeper crib is much different than bed-sharing, and is, in fact, a perfect and extremely safe solution that allows the closeness of bed-sharing without all of its dangers. 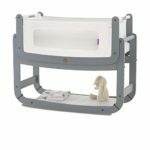 There are many varieties of co-sleeper cribs, also known as baby side-sleepers, but the most ideal and versatile of these look very much like traditional cribs or bassinettes, except they are made to fit up against your bed and allow one of the sides to be lowered, giving you complete and easy access to your baby without having to get out of your bed. Co-sleeper cribs are a perfectly safe sleep solution for your bundle of joy, assuming of course that you purchase one that follows the basic safety standards and that you use it according to the manufacturer’s suggestions, as is the case with all items. Baby can’t be rolled on: because your baby will still have his own separate sleeping surface, he will be safe from the possibility of you or your partner accidentally rolling on him.Even though one side of the side sleeper can be lowered to be connected to your bed space, the other remaining raised walls would prevent you from being able to roll on him. Baby won’t be in danger of getting caught and suffocated in your bedding: again, because your baby will have her own separate sleep space and her own baby-safe bedding, like a wearable blanket, the dangers of her getting caught in your bedding and suffocating are eliminated. Baby will still be on his back on a firm mattress: again, co-sleeper cots are like traditional, safe cribs and bassinettes in every way except that a wall can be lowered. The mattress and sleeping platform is still firm and flat, as is recommended by pediatricians, and thus lowers the risk of SIDS.So all in all, the co-sleeper cot follows the “ABCs” of safe sleep: the baby is Alone (own sleep space) on his Back in a C The only difference is the ability to lower one wall to attach it to your bed. Baby is within your soothing reach: along with the ABCs of sleep safety, most pediatricians also urge parents to still keep baby in their room at night so that you can check on her and hear her. This enables you to provide the very important comfort that she needs from you, and allows her to still hear and smell you.A co-sleeper crib absolutely keeps up this standard, but makes it even easier, since you will not have to get up out of bed to check on baby; you can simply turn and reach over to pat and soothe her and make sure she is breathing fine. If you want the safety and peace of mind of your baby sleeping in a crib on her back away from all of your bedding, but also want the peace of mind and accessibility of having her right next to you in eye-view and arms reach, you really cannot go with a better option than a co-sleeper cot. In the rest of this site, you will find reviews of specific co-sleeping cribs that we have investigated and found to be the best out there. You will also find a buyer’s guide, and some helpful info in our blog. Always read the manufacturer’s instructions and use accordingly. Everything can be dangerous if misused.